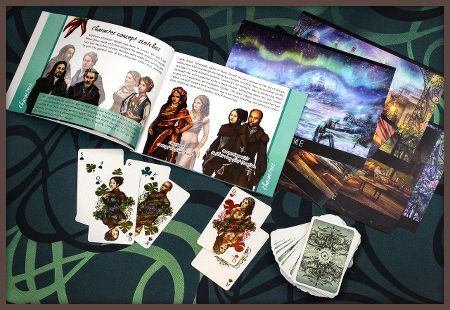 With Solstice coming out this Thursday at a reasonably high chance of not being delayed by another two years, let’s talk about the various available editions and their pricing. Note: Steam key becomes active only after the game lands there in April. Printing: All extras are print-ready and Gracjana included a short document with tips on how to do it best. Delivery: We’ll be mailing the physical merchandise manually, so it’s likely to take a few weeks. Any shipping costs are included in the price. Digital extras and the game itself are available instantly upon purchase, of course. Pre-order upgrade: We’re going to have an upgrade option for pre-order owners who would like to get the merch without having to re-buy. Please email me at tom@moacube.com if you are interested. Preferably before the launch, so I can reserve a copy for you. If you have any questions, hit us up on Facebook, Twitter, or Tumblr. Solstice trailer and release date! Hold on to your warm blankets! 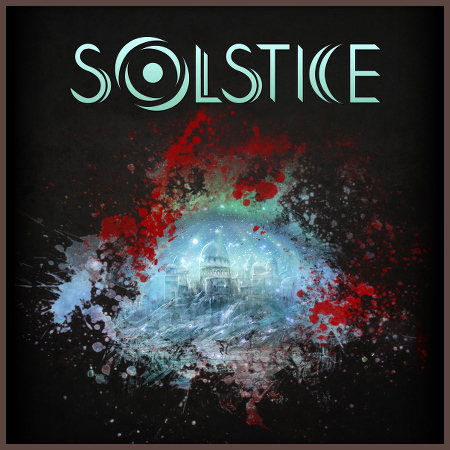 Solstice is coming out on February 11th! That includes the collector’s and limited editions, of course, and we’ll update you regarding their pricing and delivery soon. Steam release will follow sometime in April, though buying the game from us gets you a key anyway. You’ll just have to wait a bit before it becomes active. The Solstice pre-release is ON! As soon as Solstice development creeped into November, we realized we’ll have to wait for the holidays to end before even considering a public release. But we also wanted to give pre-order owners something to play during those long winter nights. And tonight is the longest night of all – the winter solstice! 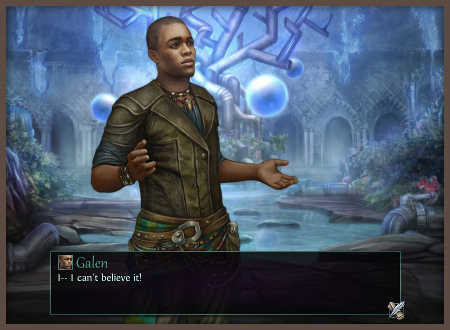 Which is another way of saying Solstice is out for all pre-order owners! Check your inboxes! Also, as promised, we’ve upgraded all your purchases to Digital Collector’s Edition! This has been a long and harrowing project. Probably the most difficult in our careers. But it may as well resulted in our best game to date, filling us with an equal measure of anxiety and excitement, to finally be able to show it to a larger audience. We really hope you’ll like it! Just please note that, while we and our play testers put a lot of effort into making sure everything works fine, this is the first semi-public release. If you encounter any problems, just drop me a line at tom@moacube.com. Same if for some reason you haven’t received your copy. Have fun, guys! And Happy Holidays! With the Solstice launch so close, we’re ready to announce the contents of our Collector’s Edition. Because, yes, it’s going to be a thing! Or two things, actually. We’ve prepared a Digital Collector’s Edition with plenty of cool downloadable extras as well as a super-exclusive Limited Edition with actual physical goodies! 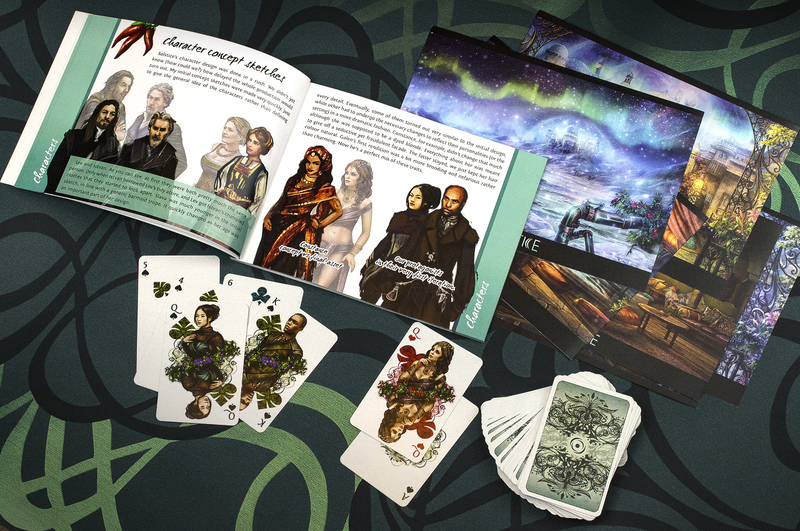 The cards and the art book we’re particularly proud of. They really came out great and the print quality is really top notch! We also have a little surprise for all pre-order owners. We know it’s been a long wait and we fully expected you to come to our door one day, pitchforks and torches in hands. But instead you’ve shown us incredible amounts of patience and support. As a token of our gratitude, we’re going to treat all pre-orders as if they were Digital Collector’s Edition purchases. And when do you get to play the game? No date seems more fitting than the actual winter solstice at December 22nd. With public release to follow somewhere after the holiday craze is over (more news on that soon). We’re one week into the final playtests of Solstice and it seems like a good moment to close pre-orders for the game. Thanks to everyone who supported us by getting the game early! We hope it’ll be worth the wait! The tests are going well though it’s a lot of hard work still. So far, we’ve got over 100 reports with bugs, feedback, and general impressions. Compared to Cinders, we’re seeing far less language issues (hiring Cara as our editor was a great idea! ), but the game is still pretty buggy, especially towards the end. General feedback is overwhelmingly positive, though, which is frankly something our entire team really needed after those three years. Thanks, guys! We’re still undecided on the official release date, but pre-order owners can expect to get their copy soon. Solstice is done! Final tests begin! Hold on to your seats, guys! 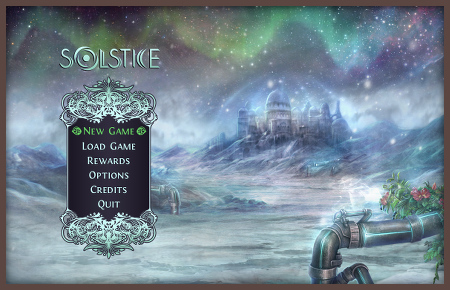 We’ve finally finished Solstice and are ready to start that one last round of play testing! It honestly feels quite… unreal. If you volunteered to be one of the testers, you should get an email with download links and some instructions soon. And yes, we’re still looking for more help, so drop me a line if you pre-ordered the game and would like to give it a spin. As for the launch date, we frankly walked ourselves into a corner of end-of-the-year major sales and releases, and we’re not sure what to do about it yet. One thing is certain, however: pre-order owners will get their copy as soon as possible, regardless of our final decision on this. We may also have another nice surprise coming for you along the way, so watch this space! So hey! That Solstice! It’s almost out. Some crazy three years this was, eh? We can hardly believe it ourselves! It’s been three years! Three. Years. So what exactly does “content complete” mean? Basically, it’s a stage where the entire game is done and can be played from start to finish, even if it’s still going to be a somewhat bumpy ride. As we have a habit of doing playtesting runs as we go, and started working with an amazing editor during this project, that “bumpiness” is limited to the final two chapters. Still, it’s there and has to be ironed out before the release. We’ll be doing some internal tests first. Fix already known issues, make sure the game doesn’t crash, generally polish it up. Along the way, we’ll be closing pre-orders. It’s the last chance to get one, if you want to access the game earlier. Then we’ll have one last round of closed testing. We’re counting on you here! After it’s done, the game becomes available to pre-order owners! The official launch happens around two weeks later! We get very, very drunk! For the closed playtesting, we’ll be once again enlisting your help! If you want to take a part, please drop me an email at tom@moacube.com Especially if you tested Solstice during the earlier stages! That’s it for now! Thanks again for your patience and continued support, guys! 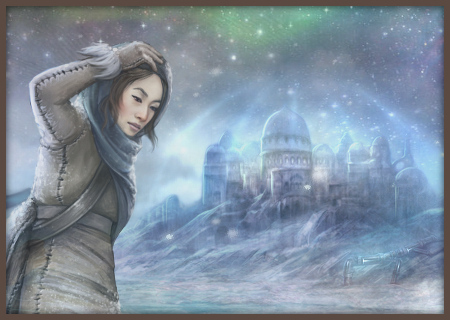 And while we were busy with Solstice, Kate finished re-doing Bonfire‘s artwork. All of it! So yes, the game is very much alive despite the lack of public updates. We realized we’ve made a mistake by focusing on small incremental improvements, while much more drastic changes are necessary to finally leave the alpha stage and reach anyone outside of the few dedicated playtesters. As we chipped at the sheer amount of Solstice’s content, Kate patiently experimented with different art styles and re-drew the entire game sprite by sprite, preparing it for the new design direction we have in mind. When I’m more free to work on it (that is: once our monster-of-a-VN is out), we plan to release a new public demo, to see if the changes we’ve planned are on the right track. Expect more news on what’s going to be different as we go, but we can already tell you we’re very excited about how it’s shaping up! Yup, stretches. Like, we’re on the last one! And yes, I know we kinda are since 3000 BC, when we started doing Solstice pre-orders. But this time for reals, and I’m counting down remaining scenes (21 at the moment of writing this) on my twitter. Once it’s done, I have some effect and features coding left to do, and then we can move to final playtesting and editing. If it goes well, I’d say early Summer release is pretty likely (would be awesome to launch on actual monthly gift box subscriptions!). Meet Cara “Cheratomo” Hillstock. 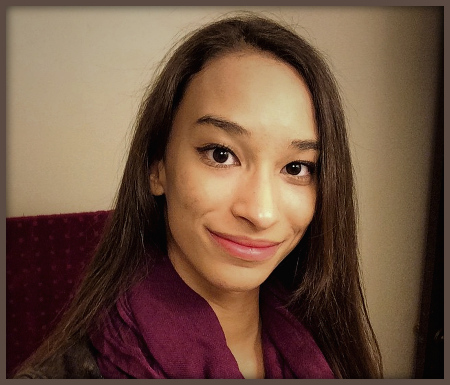 She’s our editor for Solstice and she’s super-awesome! She already went through half of the game’s script and what can we say — it’s all so much better now! We know Cinders was a little rough around the edges language-wise when it first launched. Solstice should be way more polished from the get go thanks to her invaluable help. Cara also works on her own successfully kickstarted visual novel Asagao Academy. It involves dating competitive gamers and a pink-haired protagonist’s journey through romance and friendship. Check it out! It’s this time of the year again, and boy what a crazy year it was! Solstice is still in development. The delay nearly killed our young studio! But then Cinders landed on Steam thanks to your insane support on Greenlight! But then it did worse than expected on launch. But then not that bad in the long run. And then we were in the Humble Weekly! And then the playtests happen and prove that wait on Solstice was worth it! And then it’s like: Woah, 2014 is already over! It’s all ups and downs with indie game development. Never steady. Never boring. And during this crazy roller coaster ride, you guys have been there for us with your incredible patience, support, and words of encouragement! 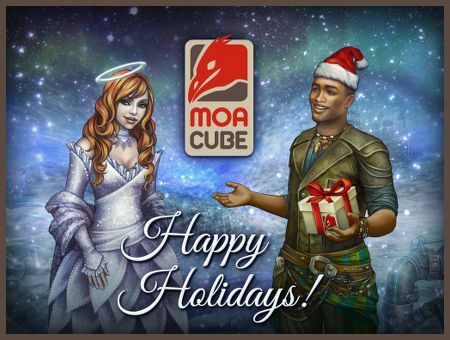 So please, allow me to thank you on behalf of the entire MoaCube team. We wish you the happiest and warmest Holidays ever! Just like the last year, we’re also running a special sale on Solstice pre-orders and Cinders. Both are 40% off till January 7! Steam keys are included (in case of Solstice, obviously only once it’s out on the service) and the purchase can be made as a gift for a friend. Cinders is a mature retelling of Cinderella, ditching the passive protagonist and banal morals of the original story in sake of a more serious approach. Independent scientific study proved Cinder to be the raddest gift this holiday season! Solstice is a mystery thriller about small personal disasters that can turn into great catastrophes. And a clear conscience that is as rare as pure snow. The game is in pre-orders. Purchasers receive a lengthy preview build. Happy Holidays, folks! Here’s hoping 2015 will be less of a bumpy ride!